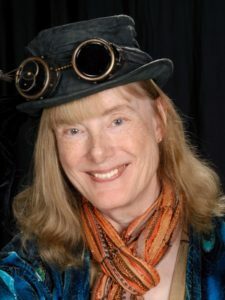 Author Laurel Anne Hill is an award-winning author of science fiction, fantasy, steampunk, and horror. Many of her stories inspire readers to choose the way of worthiness. Laurel is a fellow Broad Universe member and costumer with whom I’ve shared many a rapid fire reading with. Hello, I’m Laurel Anne Hill, author, and former underground storage tank operator. Really! My day job for many years included environmental health and safety at a pharmaceutical research and development facility. I grew up in San Francisco with more dreams of adventure than good sense or money. My close brushes with death, love of family, respect for honor, and belief in a higher power continue to influence my writing and my life. I’m blessed to have a loving husband and four wonderful children. I started writing before I could read. Stories created themselves within me and I’d tell them to my older sister and she’d write them down. I’d illustrate my tales with pictures from comic books and magazines. My sister loved to write her own stories, too. I admired her and still do. 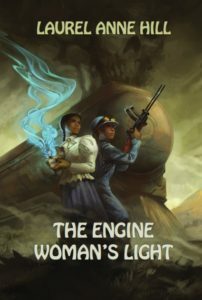 Can you share a little about your current book, The Engine Woman’s Light, with us? First of all, when I was a teen in the 1950s, my beloved maternal Swedish grandmother had paid the hospital bill for the birth of one of my sister’s sons. The bill had cost Grandma much of what she’d possessed. Grandma died in 1989. In the early 1990s, my memories of her remained close. Next, a month before I birthed my daughter in 1979, I’d fallen and broken my foot as I left work in San Francisco. My husband, David, had expected to meet me on the other side of the bay. Cell phones as we now know them didn’t exist. I hadn’t wanted to worry David by not showing up when expected. I’d walked on a broken foot, taken public transportation, and traveled thirty miles to reach the train station near our home. I’d gone through a number of potential titles during the writing process. When I sent my manuscript to Sand Hill Review Press, I’d entitled the novel “Woman of the Light.” That title hadn’t worked for the editor, so I chose The Engine Woman’s Light. Some experiences are based on events in my own life, as explained above. Also, I’ve hiked, camped, run rapids, ridden horseback, and operated a steam locomotive. I love the work of many authors, such as Neil Gaiman and Graham Joyce. I think, however, the work of children’s authors have had the biggest impact on my life. For example, Elizabeth Foster, author of Gigi: The Story of a Merry-Go-Round Horse, showed me the magic created when blending imagination with the reality of world conditions and history. My mentor is Charlotte Cook, a writer, editor, and dear friend. She has the ability to read a story and determine with ease what makes the piece work and what doesn’t. 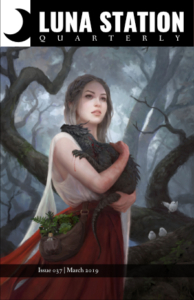 Julie Dillon, winner of the Hugo and Chesley awards, designed the cover of The Engine Woman’s Light. I love the vibrancy of her art and her breathtaking ability to portray diverse women protagonists.